This is a crap story. It’s just one more bubble in my suds of cynicism. If you make the limelight, you can expect to be scrutinized on every angle. 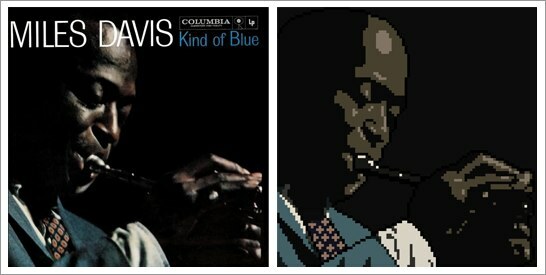 Kind of Bloop is an 8-bit tribute to Miles Davis’ most successful album. It was curated by Andy Baio who’s been blogging and posting links forevers at waxy.org, and is a cofounder of kickstarter. Baio did everything he could think of to make this a legitimate and lawful release. With the help of kickstarter, he raised the needed funds to pay the licensing fees for all tracks on said album. It turned out to be an awesome stroke of cross promotion; being covered by Time Magazine among others. Kind of Bloop was released nearly a year ago. I listened to it a couple times, it’s fun; Shnabubula’s “All Blues” is all over the map. I do wish, however, that all the classic jazz lovers who abhor this conceptual tribute would give it a solid listen. I understand some folks can only tolerate acoustic music, but I wish they could also appreciate the skill, effort, and detail that make these ‘computerized’ renditions so organic, human, and unique. 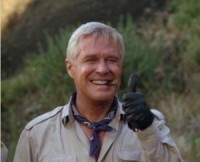 It’s all jazz — even when Hannibal, of the A*Team, is forming a plan. So here’s the crap — the cover of the album has it’s own copyright holder, photographer Jay Maisel. He never gave consent and claims he never would have if asked. Even though Kind of Bloop’s cover is an 8bit translation, it apparently failed to diverge enough from the original. Maisel, with money and lawyers, managed to pin Baio for a mere $32,500. Maisel is an artisanal juggernaut, people pay him $5k for weekend workshops. Jay Maisel is the man. 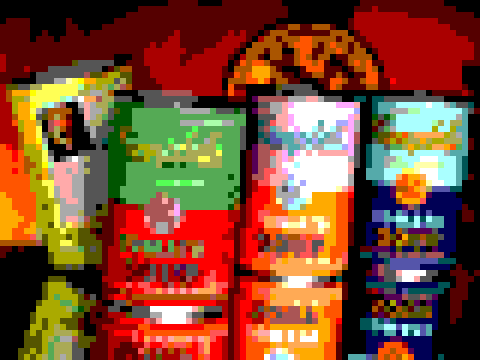 Campbell’s Soup never sued Andy Warhol for making their cans look like vomit. I’m kind of worried about Campbell’s masculinity. I’d like to make an analogy using a Mr. Show skit from the perspective of the legal world. The guy with the bloody ear is a younger generation of artist who flirts with mashups and chipmusic covers. The donut clerk is the court. The seated acquaintance is the elder established artist, the hipster from the 50′s bronze age of jazz. Fair Use has always sounded like a trap to me. Yeah, you’re in the clear as long as you make no money. But what if you had something that went mad viral, containing copyrighted material, and it launches your artistic career? Can that copyright holder, with enough lawyer power, find a way to garnish your new professional wages? In most lawsuits, the court sides with the established juggernaut mother. Please read Andy Baio’s account on the situation. I liek this so much, from the title to the established juggernaut mother! And I’m thrilled I’m not the only one out there worrying about Campbell’s masculinity!